Trees affect us not only with their Amazing beauty but with their ability to Aid in Magic. 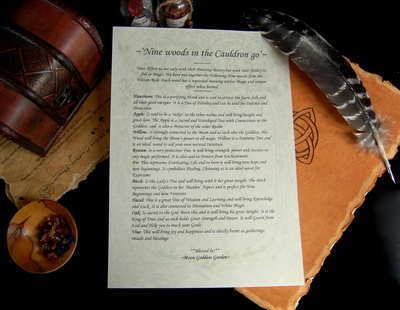 This Leaflet lists the 'Nine woods in the Cauldron go' from the Wiccan Rede and their uses when Burnt. This A4 poster has been printed on high quality paper and has been Designed by ~Moon Goddess Garden~ from our own Book of Shadows.